Ocean Cleanup, a Dutch-based company which aims to eradicate all the plastic waste from the world's oceans, has officially launched its ambitious project. Ocean Cleanup, the ambitious project of a young Dutch innovator to clean the ocean of plastic waste, is promising to do away with half of the Great Pacific Garbage Patch within 5 years. There are many scientific attempts aiming at reducing our reliance on disposable plastic by looking for biodegradable options in nature. For example, the biotech startup Humble Bee is trying to reverse-engineer the “cellophane-like” substance produced by the Australian masked bee to turn its nest into a clean form of bioplastic. However, even if the world completely cuts its use of plastic, we’d still have a serious problem: plastic trash that’s still out there, especially in the ocean. Plastic pollution is an environmental headache that, while the world has yet to figure out a solution to, keeps menacingly growing. Most of the waste we throw out every day is plastic, and most of it finds its way to the ocean where it joins the floating litter continent, driven by marine currents. In parallel to finding clean alternatives to plastic, we need a radical solution to ocean plastic, and a young Dutch innovator may have found that. On September 8, a ship towing a floating boom left San Francisco Bay heading to the Great Pacific Garbage Patch, marking the official launch of the project Ocean Cleanup. Five years of preparation and tests have passed since the project was first announced. Based in Rotterdam, Ocean Cleanup was founded in 2013 by then 18-year old Dutch inventor Boyan Slat, who is the youngest-ever recipient of the Champion of the Earth award (2014), the UN’s highest environmental honor. Via his non-profit organization Ocean Cleanup, Slat hopes to end the ocean plastic pollution once and for all. The ambitious endeavor has now officially started with the deployment of System 001, comprised of the floater, a 2,000-foot long boom and, attached to it, a 10-feet deep skirt. The boom corrals plastic litter that’s floating on the surface and keeps the system buoyant, while the skirt catches plastic bits underwater. Equipped with sensors, cameras, and solar lights, the whole system is passive, meaning it needs no power to move except that of currents, the same that carry plastic waste. And through satellite connection, it communicates its location continuously. The system is designed so that natural oceanic forces carry it faster than plastic garbage, and concentrate it in the center of the “U” shaped by the boom. Ships would then take plastic waste corralled by the system back to land where it’s recycled. The Ocean Cleanup foundation aims to take out half of the garbage patch within five years when all the planned 60 systems are deployed by 2020. For Ocean Cleanup’s CEO, Boyan Slat, he doesn’t only think this lofty goal is attainable, but that his system is the only drastic solution to the ocean plastic pollution that needs to be addressed. “This area is twice the size of Texas. If you were to skim that with boats and nets, it would take around 79,000 years,” said Slat. 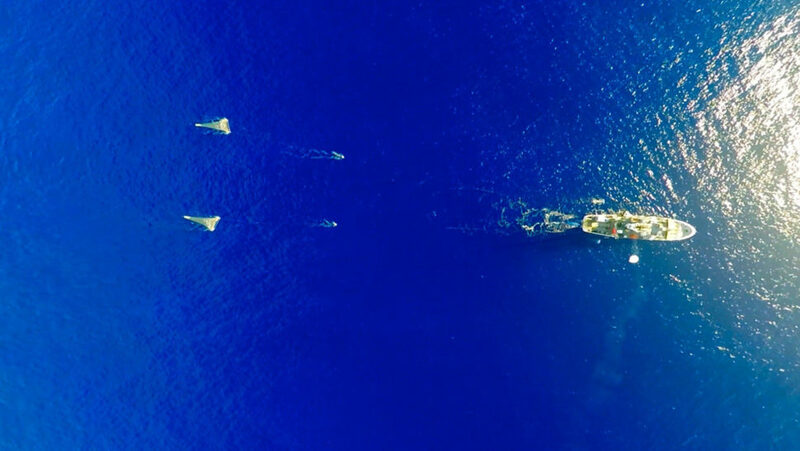 “We expect to remove half of the area of the Pacific garbage patch every five years”. So, you’d think that theoretically means the Ocean Cleanup’s floating systems would take out the whole plastic continent within a decade. However, the foundation estimates that it will collect 90% of the plastic garbage within two decades. Maybe because the concentration of the waste diminishes with time and with it the system’s efficiency. Apparently, even with a 20 years deadline, that’s not a sure thing. Some experts remain skeptical about the efficiency of such system for one reason: a lot more plastic garbage will be poured into the ocean than what Slat’s system would gather. George Leonard, chief scientist of the Ocean Conservancy, an environmental advocacy group, thinks that without stopping plastic waste from reaching the ocean, this will be a “Sisyphean task” or a mission that never really ends. It’s estimated that about 8 million metric tones of plastic waste end up in the ocean every year. Now it remains to be seen how much Ocean Cleanup’s systems will be able to collect. What do you think Ocean Cleanup should do with the plastic once it’s collected?